Fifty-five students put on their Honeywell Summer Science Week at the MOST t-shirts one last time and discussed their days of rigorous science and serious fun as they reunited on Wednesday morning for a final exploration of Onondaga Lake. In the afternoon, family members, teachers and Onondaga County Executive Joanie Mahoney listened as they reported on their experiences and the data they collected last week. 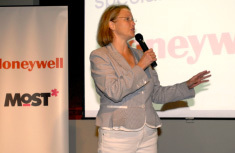 County Executive Joanie Mahoney tells students to continue their science education so that they will help make a positive impact on the environment. A happy student receives her certificate from County Executive Mahoney, Honeywell Syracuse Program Director John McAuliffe, and MOST officials. 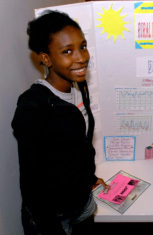 Students review and prepare to share data with family and teachers from their week as scientists. A student presents her science week data to her teacher and parents. The students’ final science expedition Wednesday morning was an Onondaga Lake boat tour on the Mid-Lakes Navigation’s Emita II. Students were joined by Syracuse University’s Distinguished Professor of Civil and Environmental Engineering Dr. Charles Driscoll. Driscoll is known for his studies of the impact of acid rain and mercury on lakes and has contributed to the study of the Onondaga Lake remediation. 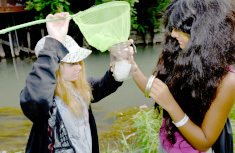 With notebooks in hand, the students spent the Honeywell Summer Science Week exploring the Onondaga Lake watershed. They spent an afternoon geocaching on an Onondaga Creek walk, visited Heiberg Memorial Forest and examined the geology of Clark Reservation. Students prepare for exploring Onondaga Creek. They spent the afternoon catching bugs. Summer Science Week activities also included a visit to the Shrub Willow Farm in Camillus. The students learned about Onondaga Lake bird life from Montezuma Audubon Center Director Frank Moses. They also received hands-on experience in hydraulic testing, GPS usage and how to conduct an insect survey. 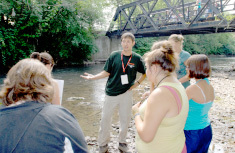 MOST Exhibit Project Manager Dr. Peter Plumley and State University of New York College of Environmental Science and Forestry graduate students served as the young scientists’ tour guides throughout the week. One of the students’ favorite activities was learning about plants along Onondaga Creek on Tully Farms Road. “It was really interesting and I liked learning about different plant life,” said Morgan Nichols from Camillus Middle School. “I think the whole experience was interesting. It was fun learning how to make rope out of plants,” said Madelyn Kelly from J.T. Roberts Middle School. A graduate student helps a young scientist identify an insect. Students examine an insect they caught. 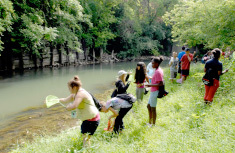 Students collect data from Onondaga Creek. Students take notes about the history of the creek. 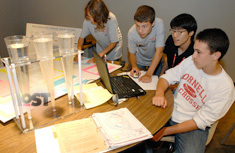 Honeywell Summer Science Week gave students many chances to explore their local environment hands-on. At the end of the day, student-scientists received completion certificates and became MOST Associates. The title of MOST Associates grants each student a one-year museum pass. 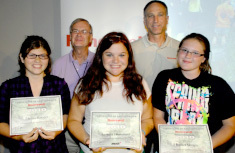 Young scientists show off their completion certificates with MOST President Larry Leatherman and Honeywell Syracuse Program Director John McAuliffe.